As a user of web design tools (e.g. iWeb), I’ve been challenged with adding Google Analytics code to the html pages they generate. I used to be able to use a free Automator flow to add the code, but when upgrading to Lion, I found that the old flow was not compatible. Other tools such as the iWeb SEO Tool seemed to help, but I ran into issues there as well. Way too much trouble for something that should be easy. So I decided to write my own tool! With my tool, you can select files via the UI and then process them by adding a code snippet in front of the </head> tag. 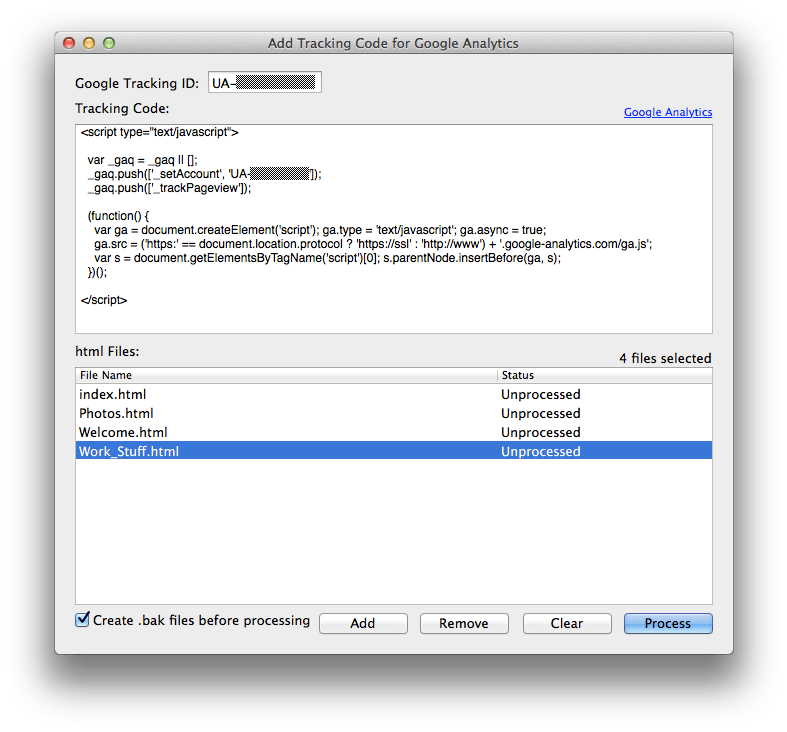 If the file already contains Google tracking code, it will not be processed. The tool also allows you to create backup file before modifying the original html file. Version 1.1 is now available! (2/26/14) – Changes: Resizable window, drag-and-drop support, UI enhancements, OS X 10.9 compatibility, bug fixes.